Talk to Brynjolf in Riften or talk to the Argonian bartender in The Bee and Barb. Search the Ratway for Esbern's hideout. Find Esbern in the Ratway Warrens. Bring Esbern back to Delphine at Sleeping Giant Inn in Riverwood. After infiltrating the Thalmor Embassy, return to Riverwood and inform Delphine of what you learned from the Thalmor records. Delphine is surprised to know her old colleague and fellow Blade, Esbern, is reportedly still alive. She tasks you with finding the archivist from his hiding place in Riften. Due to the clandestine nature of the Blades, Delphine gives you a secret phrase to deliver to Esbern in order to secure his trust when you locate him. Depending on your standing with the Thieves Guild, the journal will direct you to talk to Brynjolf, or search the Ratway for Esbern. If you are directed to find Brynjolf, you may speak to him, Dirge, or Vekel the Man inside The Ragged Flagon. All three give an option to persuade or bribe them for information on Esbern's location. Let me find him first. Dragons are bad for business. (Persuade) Passed: Aye, you've got a point there. I need to talk to him. I'm a friend. His life's in danger. (Persuade) Passed: Maybe I'm just getting soft in my old age, but I actually believe you. Maybe this will help your memory. (Bribe) Passed: Well... when you put it that way, I think I do know the old guy you're talking about. I need to talk to him. I'm a friend. His life's in danger. (Persuade) Passed: A friend, huh? Well... then it's probably okay if I tell you. Maybe this will help your memory. (Bribe) Passed: You know what? I think I do know the guy you're talking about. I can break some of your bones if that's what it's going to take... (Brawl) Passed: Easy there. I don't want that kind of trouble. Guy ain't worth it. Brawl: Yeah. That's what it's going to take. Victory: You're tougher than you look. You got me, fair and square. He lives somewhere in the Ratway Warrens. Must be crazy or desperate to live down there. Maybe both. If you have already joined the Thieves Guild, the Ratway is accessible and you can locate Esbern directly. Speaking with Keerava, the Riften innkeeper, also advances the quest. The Ratway and the Ratway Vaults beneath Riften are inhabited by a number of lowlifes, vagrants, and three or four Thalmor warriors searching for Esbern. When you reach the door to Esbern's room in the Ratway Warrens, he is very wary of Thalmor agents and initially refuses you entry. You may persuade him by saying Delphine sent you, you can tell him the password Delphine gave you: "Where were you on the 30th of Frostfall? ", or you may explain that you are the Dragonborn. Once Esbern lets you in, he has some dire predictions about the state of the world: Alduin the World-Eater's return has apocalyptic implications, and Esbern's warnings of this threat have been consistently ignored. Esbern makes it clear that there had been no hope until you arrived and that he had believed the world was going to end. He agrees to follow you to Delphine's base in Riverwood. Before leaving, however, Esbern will scamper about his room, claiming that he has to remove any sensitive information the Thalmor may discover. He will also gather some supplies from the chest at the foot of his bed and then will be ready to leave. The quest ends here and the next quest, Alduin’s Wall begins. If any follower is hired prior or during the quest, they will not be forced to return to their original location when Esbern comes along, making him a second follower. Gissur may be seated at a table in the Ragged Flagon when you get Esbern's whereabouts from Vekel the Man. After you end conversation with Vekel, Gissur will get up from the table and leave the Flagon. Vekel will suddenly say "That one, right there, walking out the door! He was one of them asking about that old man you were looking for." If confronted, Gissur will only rebuff your attempts at conversation. However, he can be attacked and killed with no repercussions, and other Thieves Guild members will join the fight on your side. This may make your escape with Esbern easier. If A Chance Arrangement has been started, Brynjolf cannot be talked to. It is possible to proceed directly to Esbern without returning to Delphine first. 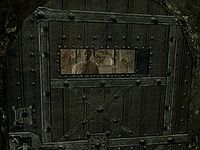 Esbern will unlock his door if you tell him you are Dragonborn. The quest may fail to start after completing Diplomatic Immunity, and even trying manually start or end it with the console will not work. You may have to skip forward to the start of the next quest, Alduin's Wall, by using the console and typing in setstage MQ203 5, which will allow you to continue. Use console command setstage MQ202 (stage #) to force Esbern to open the door and talk again. Stage 160 makes Esbern open the door, if bugged. Stage 170 makes Esbern talk again, if bugged. Another easier way to avoid bugs is to type in CompleteQuest MQ202, which would work for any quest value. The next quest may fail to start upon this quest's completion. ? 10 The Thalmor are just as puzzled as we are about why dragons are returning. I learned that they are looking for a Blade named Esbern, who Delphine says is an expert on ancient dragon lore. We need to find him before the Thalmor do. 50 The Thalmor are just as puzzled as we are about why dragons are returning. I learned that they are looking for a Blade named Esbern, who is supposed to be an expert on ancient dragon lore. I've learned that he's hiding out in the Ratway Warrens in Riften. 150 The Thalmor are just as puzzled as we are about why dragons are returning. I learned that they are looking for a Blade named Esbern, who is supposed to be an expert on ancient dragon lore. I found Esbern hiding in the Ratway in Riften, and convinced him to let me in to explain myself. 180 Finishes quest The Thalmor are just as puzzled as we are about why dragons are returning. I learned that they are looking for a Blade named Esbern, who is supposed to be an expert on ancient dragon lore. I found Esbern hiding in the Ratway in Riften, and convinced him to let me in to explain myself. The following empty quest stages were omitted from the table: 0, 1, 5, 55, 56, 60, 65, 70, 100, 130, 140, 145, 160, 170, 175, 200, 300. On the PC, it is possible to use the console to advance through the quest by entering setstage MQ202 stage, where stage is the number of the stage you wish to complete. It is not possible to un-complete (i.e. go back) quest stages, but it is possible to clear all stages of the quest using resetquest MQ202. Esta página foi modificada pela última vez à(s) 07h27min de 22 de novembro de 2015.